Enough experts lay out the preliminary deal between the Sudanese Government and the Darfuri rebel group JEM. As the ink still dries on a preliminary deal between the Government of Sudan and Darfur’s largest rebel group, the Justice and Equality Movement, the situation at the Darfur peace talks in Doha, Qatar is changing rapidly. Here’s an update capturing what we are hearing from various sources in Doha or close to the talks, recognizing that the situation remains highly fluid. In large part, the agreement is a pledge to have further negotiations, but it does include some important immediate steps. Key provisions include a two-month ceasefire, release of JEM prisoners in Khartoum (this notably includes JEM leader Dr. Khalil Ibrahim’s half-brother), and recognition of JEM as political party. The framework agreement also identified some of the key topics to address during formal talks, including power and wealth sharing and compensation for Darfuri victims, and stipulates that negotiations should conclude by March 15. This rapid timetable is obviously somewhat unrealistic given the complexity of issues such as the demobilization of forces, a fact which even some of the mediators quietly acknowledge. There is also talk of postponing the state and gubernatorial elections in Darfur until a later date (perhaps November) Contrary to some press reports, our source was confident that the presidential election in Darfur will proceed as planned in April. This formulation on elections has appeal to both JEM and President Omar Hassan al-Bashir. Bashir would get to claim ‘legitimacy’ with an April presidential victory that included Darfur, and JEM would be given more time to establish itself as a political party before parliamentary and gubernatorial elections take place in Darfur. JEM’s Khalil Ibrahim insisted in a press conference that no one from his group would stand in the upcoming elections. This declaration would seem to be at odds with his desire to establish JEM as a viable political party. And the insistence perhaps unwittingly acknowledges an unwritten understanding that the Sudanese government would grant political posts to JEM before the rebels would even need to run for office. We understand that there is also tacit agreement between JEM and the Government of Sudan that a vice presidential position would go to a Darfuri, but not a JEM leader. Ibrahim might receive a governorship. 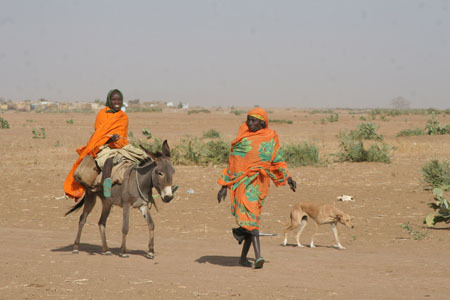 Making the situation even more murky, the process of negotiations between JEM and the Sudanese government has been accompanied by a parallel effort to unite other Darfuri rebel groups, a number of whom are now negotiating as a block called the Liberation and Justice Movement. Tensions clearly remain between JEM and these other groups, and the ability to reconcile these tensions will likely determine if the agreements of the last several days are a genuine breakthrough or yet one more series of broken promises. The African Union-United Nations mediators, the Qatari hosts, and U.S. Special Envoy Scott Gration are pushing for the Liberation and Justice Movement to negotiate with the Government of Sudan on a parallel track to JEM, with a plan to bring the two tracks together toward the end of talks. The Liberation and Justice Movement, the Government of Sudan, and the mediators are reportedly putting finishing touches on a framework agreement, which is expected to be made public shortly. The Liberation and Justice Movement framework agreement reportedly closely resembles JEM’s (minus the prisoner release provision). The Liberation and Justice Movement consists of 10 separate groups, five of which reportedly receive backing from Libyan President Muammar Qaddafi. The groups have more or less rallied around a leader, former governor of Darfur Tijani Seise, though there are already reports of some displeasure among the ranks because he is a civil society leader and not a rebel. There is an understanding that he could be named vice president at the end of negotiations. One rebel faction still not bought in to this coalition is the group with ties to prominent Darfuri leader Abdel Wahid, who lives in Paris and has refused to join the talks in Doha. This group, known as the Wahid Commanders, issued a statement declaring a commitment to peace, but refusing to join the Liberation and Justice Movement or to accept Tijani Seise as the leader because of his presumed links to the Libyans. Wahid himself was dismissive of the agreement with JEM, calling it a “ceremonial peace.” International negotiators have long been frustrated by Wahid’s reluctance to join unified talks, but it is also clear that he maintains an important base of support among Darfuris. The mediation team is charging ahead with its dual track approach to negotiations, despite the protestations of JEM leader Ibrahim, who appears to feel that smaller rebel groups and civil society do not deserve a prominent place at the negotiating table. The African Union-United Nations mediators, the Qataris, and the U.S. special envoy all seem to support the parallel negotiation track, not necessarily because they see it as ideal, but because they think it is the best they can do at this moment. This may be an accurate assessment on their part, but there are obvious pitfalls to such an approach. Some of these so-called leaders are taxi drivers in N’Djamena and street sweepers in the Netherlands. They will not negotiate with the Government of Sudan while we are also negotiating. It is up to this forum to choose whether to let us negotiate alone or have the others negotiate. People in Darfur and Kordofan will not accept that movements will be made in the lobby of hotels. One interpretation of Dr. Khalil’s remarks was that JEM is trying to intimidate the mediators into giving JEM the greatest possible leadership role even while recognizing that the mediation team won’t back down from the parallel track approach and that other groups will have to have their voices heard over time. Ultimately JEM also likely recognizes that this brinkmanship has its dangers, and they could well be blamed if talks collapse – leaving them in a vulnerable position both politically and militarily. Diplomats remain optimistic that the two-track negotiations would proceed and hope that an agreement on the terms of the formal talks can be made public next week. The primary calculations driving the position of the Sudanese Government and its ruling National Congress Party are not difficult to discern in this case. First, an agreement with JEM would allow the western front of Darfur to remain relatively quiet over the next year while the government turns its attention to the larger strategic issue of possible independence for South Sudan and the independence referendum scheduled for January 2011. If war with the South were to reignite, which remains a distinct possibility, the ruling National Congress Party does not want to be fighting a two-front war. The deal with JEM has also generated considerable speculation that both the National Congress Party and some like-minded Arab states are eager to unify Sudan’s Islamists at a time when the country is facing considerable secessionist pressures. Speculation on this front was further heightened when Dr. Khalil spoke in his public comments about working for the unification of Sudan. This likely struck a nerve not just among southern Sudanese, who very much have their sights set on the independence referendum, but among non-Arab Darfuri rebels and members of civil society. The fact that the Qataris have facilitated the deal with offers of incredible largesse may also fuel concerns surrounding the motives and timing of the JEM deal. President Bashir is also deeply focused on using the April 2010 national elections as a means to legitimize himself, help fend off war crimes charges from the International Criminal Court, and minimize threats to his rule within his own party. A “successful” election in Darfur, ironically financed in no small part by the international community, would allow Bashir to again argue that he should not be held accountable for his repeated and flagrant violations of international law. It is also clear from comments of the U.S. special envoy that President Bashir hopes to use the JEM agreement to pave the way for lifting of U.S. sanctions. One can only hope that any consideration of altering the current sanctions regime is based on demonstrable changes on the ground, as per the U.S. policy on Sudan, not simply the willingness for Khartoum to sign a piece of paper. Recent Chad-Sudan steps to mend relations put JEM in a difficult military position, with the rebels potentially losing a key source of material support from Chad as well as its base of operations within Chad. JEM leadership likely recognized that this unique moment of time – with the convergence of interests between the presidents of Chad and Sudan and the Qataris pushing hard for a deal – was likely the high water mark for them being able to gain concessions. By striking a deal, JEM may also calculate that they could be seen as a genuine game-changer by Darfuris, allowing them to expand their influence from being primarily based on military strength to becoming more of a political force. The various factions unified under the newly formed Liberation and Justice Movement understand that they must present a united front to negotiate with the Sudanese government, and they have been feeling pressure from international actors to do so. While some of these smaller groups may be uncomfortable with how negotiations have played out so far, some are genuinely eager for peace and others are feeling squeezed by their respective patrons. In short, those groups that have joined the Liberation and Justice Movement may see this as the only game in town. Qatar has driven the negotiations, much more so than the United States, European Union, African Union-United Nations mediators, or the Egyptians. The Qataris are eager to be able to take credit for backing the negotiations. They demonstrate an Arab unity of purpose, and are willing to put in enormous resources to advance their goals. Amid initial reports that the Qataris pledged $1 billion for reconstruction in Darfur, they upped the ante and pledged $2 billion. The gravitational pull of these huge financial sums on rebel groups should not be underestimated. As the Egyptians look on with ambitions to step in as host if the Doha talks fail, Qatar remains under pressure to bring a deal to closure. Notably, while Qatar may be in a position to broker the deal, there is little to suggest that they would be an effective force in overseeing its implementation. Special Envoy Gration’s number one priority seems to be nailing down the security arrangements for Darfur and stabilizing the country in preparation for southern Sudan’s 2011 referendum on self-determination. There seems to be an understanding between the special envoy and National Congress Party officials that rolling back sanctions is the prize on the table for negotiating with Chad and making inroads in talks with Darfuri rebels. The contract for lead mediator Djibril Bassolé will expire in just over two months, so he is under pressure to show that the peace process has progressed during his 18 months at the helm. Obviously, a durable and comprehensive peace agreement in Darfur would be enormously welcome, and could help pave the way for the three million Darfuris who have been violently driven from their homes to return in an environment of genuine security. But by the same token, the numerous failed peace deals that have littered the landscape not only in Darfur, but in Sudan more broadly, remind us that good faith has often been absent from these deals. Agreements on paper have often not even been cursorily implemented. The hard experiences of Sudan’s recent history mandate that optimism be tempered with realism. In that spirit, the rapid timetable for negotiating highly complex issues, JEM’s dismissive attitudes toward other Darfuri groups, including civil society, and the reluctance of certain key rebel groups to join the process stand out as distinct warning signs. Any set of agreements should also include international mechanisms for monitoring their implementation, something that has been a major flaw of earlier pacts. It remains somewhat troubling that these agreements do not seem to reflect a well-coordinated international position, but rather a series of ad hoc arrangements between a diffuse set of actors trying to calm the situation without necessarily resolving it. Moreover, the situation on the ground in Darfur remains highly volatile, posing a threat to the negotiations in Doha. It is our hope that all of these obstacles can be overcome, and further agreements can be supported by a robust, effective peacekeeping force on the ground – an element that has been painfully missing to date.